An aerial view of Gutmann leather tannery and the other industrial sites along the Chicago River: Ald. Michele Smith says it could accommodate a major new park. 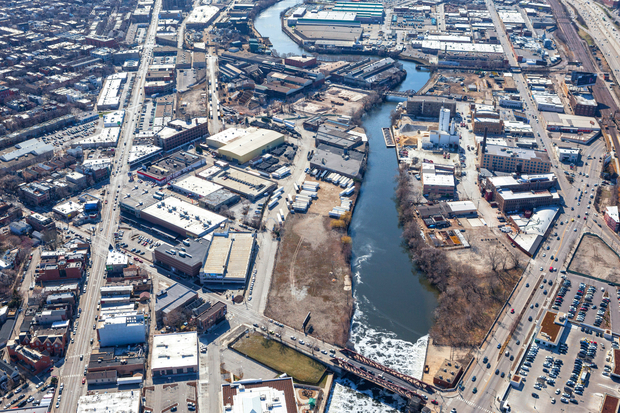 LINCOLN PARK — A North Side alderman wants the city to set aside 10 acres in the Finkl Steel development for a major new park along the Chicago River. "We have a desperate need for parks," said Ald. Michele Smith (43rd). While her Lincoln Park ward would appear to be well-served with the lakefront and Oz Park, Smith said the area west of Halsted Street and across the river into West Town, Bucktown and Logan Square is "dramatically underparked." Erma Tranter, a RANCH Triangle resident and former executive director of Friends of the Parks, agreed. "The Finkl site is just a great space to create a park that will serve West Town," she said. "It's going to serve Logan Square as well." Smith said a 30-foot-wide stretch along the river, mandated by city ordinance, and the proposed extension of the 606 bike trail across the river are insufficient. "We're not interested in a Downtown-style plan to put a little green space along the river," Smith said. "We need substantial recreational space in this community, and we don't have it." The Finkl site is privately owned, and there is no firm development plan. Smith, however, is seizing on the citywide reassessment of its 26 industrial corridors as a way to gain leverage, beginning with the Clybourn Corridor and the North Branch Industrial Corridor. The city began public meetings in June on a process to reconsider plans for the goals and guidelines for those areas, expected to dictate policy for decades, and they're tentatively scheduled to be delivered to the Plan Commission early next year. That, Smith said, gives her a sense of urgency. "I fear that we are going to miss a once-in-100-years opportunity," Smith said. "This is supposed to be a plan for the next 100 years, but in terms of green space, of parks, the planning process appears to be falling short of what any reasonable standard for park space is." "Here there is a specific opportunity," Tranter said. She estimated the Finkl site at 40 acres, augmented with another 7 from a purchased tannery and another factory site. Smith wants the need for parkland to be taken into account in those plans. Ald. Scott Waguespack (32nd), whose ward, like Smith's, abuts the 2nd Ward where Finkl is located, agreed. "There is little effort being made to guarantee new park space," Waguespack said. "There has been an effort underway via North Branch Works and other groups to push for real green space for the use by the entire community and not just new developments that are approved. "And, we're not talking about linear space like the 606, or a riverside trail, but rather a real park like Oz, Jonquil, Walsh or similar size, that allows you to play baseball, soccer or have public event space that is open," he added. Waguespack said the needs for continued manufacturing in the area should be considered as well. Ald. Brian Hopkins (2nd) did not immediately respond to requests for comment. Peter Strazzabosco, spokesman for the city's Department of Planning and Development, which is overseeing the process, said the need for open space has been raised at many community meetings. "As part of an initiative the mayor began earlier this year to modernize the city’s industrial corridors and create jobs, there is a community input process underway to inform the development framework for the entire North Branch Industrial Corridor," Strazzabosco said. "That framework will ultimately be reviewed by the Chicago Plan Commission and used as a guide for specific development proposals made within the corridor." Tranter challenged Mayor Rahm Emanuel, who has touted the river as the city's "next great recreational park," to follow through, citing the city's goal to increase parkland to 5 acres per 1,000 residents by 2020. She said Logan Square and West Town are well below those goals. "This is what the city has been pushing for — recreation along the river," Tranter said. "This is the only land that's really become available." "It's coming to a head right now," Smith said. "This is the time to do it." The question, however, is how available the land is, as it's privately owned. Smith cited decades of tax breaks received by Finkl and its former Chief Executive Officer Bruce Liimatainen, who still owns the land and has added to it, and she proposed "tradeoffs" to set the parkland aside. "The amount of open space that is ultimately included in any new development will be determined by a variety of factors, including uses, density, site layout, access points and community input," Strazzabosco said.